Sky Map: The scene on April 21 at 9 p.m. local time from mid-northern latitudes. Nearly overhead at around midnight (local daylight time) is the constellation that owes its name to a theft: Coma Berenices or Berenice's Hair. Now that the bright Moon is diminishing to a crescent in the predawn morning sky, it's a good time to investigate this faint grouping of stars. Eratosthenes in the 3rd century BC was among the first to make note of it. This pattern of stars is actually a large, loose galactic star cluster some 250 light years away that appears as a faint shimmering patch of light on clear moonless nights. It doesn't really have much form, as it looks a bit tangled. As a cluster, Coma Berenices is by far at its best in a pair of good binoculars. If, on the other hand you attempt observation of it with a high-powered telescope the impression of a cluster will become totally lost because of the telescope's narrower field of view. While virtually all of the constellations are named for mythological people, beasts and inanimate objects, Coma Berenices is actually associated with a real person. Berenice II was an Egyptian Queen, the wife of Ptolemy Euergenes (also known as Ptolemy III), the king of Egypt, who reigned around 250 BC. The story goes that Berenice sacrificed her beautiful amber tresses and placed them in the temple of Aphrodite at Zephyrium as she vowed to do if her husband returned victorious from his war against Syria. Shortly after the royal couple's happy reunion, however, the hair mysteriously vanished; apparently stolen from the temple. But it was Conon of Samos, a court astronomer and mathematician who eventually convinced the disconsolate queen that the gods had taken the locks and put them up in the sky. There is yet another variation of this story, in that Conon first points out the stellar gathering to a very angry Ptolemy (who apparently was very fond of his wife's beautiful hair)! Credit is usually given to the astronomer Tycho Brahe for first cataloguing it officially as Coma Berenices in the year 1602. 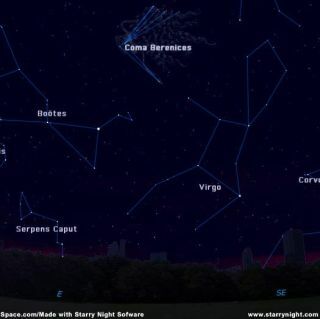 The sight of Coma Berenices high in the sky is bad news, however, if you are a fan of the Milky Way. Just to the east of this cluster is the north galactic pole, one of two points in the sky lying farthest from the ghostly circle of light that composes the Milky Way. So right now, with the cluster passing almost directly overhead around midnight, there is little to be seen of the Milky Way itself; it then runs completely around the horizon and is most always obliterated by the thicker layer of haze that perpetually rims the horizon. Conversely, when the cluster is rising or setting, the Milky Way appears to arch nearly overhead. Nowadays, you'll have to arise just before sunrise to get such a view. Or as Hans A. Rey noted in his now classic book, The Stars, A New Way to See Them: "Thus, no hair can ever get into the milk, celestially speaking."